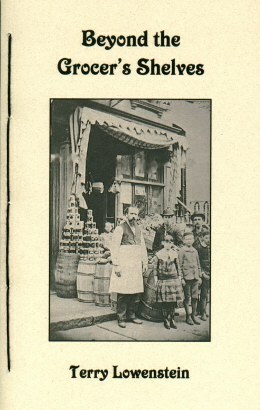 The photo on the front cover was taken between 1883-1884 and shows the Conklin family store in New York City. In the foreground wearing plaid is Lela Bella Conklin, Joel Lowenstein's grandmother. The man wearing the apron is her father-Harrison Conklin, the great grandfather of Joel Lowenstein. Joel Lowenstein is Terry Lowenstein's husband and it is with his permission the photo is used. and a juicy ripe peach is held in hand. His dreams will never be the same. Words have always fascinated me and I love the array of flavors they offer. That taste is intensified when words are allowed to steep, then poetry is the result and the blend is indeed one to savor. 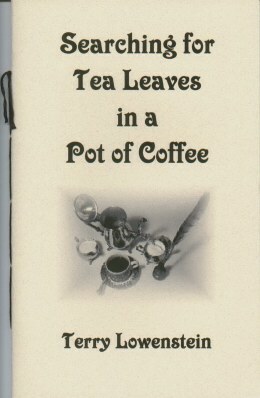 It is my wish that you will enjoy the special blend of poems that make up my first chapbook "Searching for Tea Leaves in a Pot of Coffee." to coax her to his couch. of symbolism while mocking theory. Terry Lowenstein is of Irish and French descent and was born in Virginia, but her accent betrays the years she spent growing up in New England. She now lives in North Carolina with her husband, two daughters and two cats-Dickens and Emerson. A well published writer, her day job is writing magazine and newspaper articles that include personal essays, travel articles and book reviews. 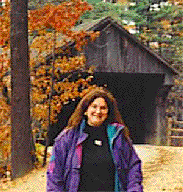 Terry Lowenstein's work appears in numerous anthologies, journals, ezines, magazines and newspapers throughout the United States and internationally.